Book Review & Giveaway: The Trouble With The Alphabet. This giveaway has ended. 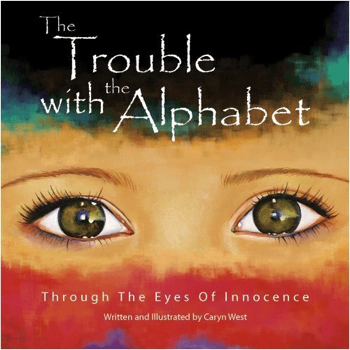 About a month ago, I was sent a book called “The Trouble with the Alphabet: Through The Eyes Of Innocence ” by Caryn West, which takes a look at human rights violations and children’s issues around the globe. I have to be honest and say that I was expecting a children’s book when I agreed to check it out, but this book is far from a book for young children to read alone. In the book, each letter of the alphabet (thus the title) represents a country where these kind of problems exist, and there is a corresponding poem that relates to those issues in that country through the eyes of a child. At first I was a little taken aback by some of the messages, as I was not really sure where the book was going with them. But then I saw that after each letter/issue/country, there is some information on what is going on in that country, what humanitarian groups are working to make things better, and advice for how you can help out as well. It is a visually stunning book, and I couldn’t help but read through the entire thing, trying to absorb what others on earth go through every single day that we don’t often think about. From women’s rights in Afghanistan all the way to the rampant corruption in Zimbabwe, this book hits on so many issues it’s hard to pick one to focus on or decide which is the most pressing. At the end of the book, the Universal Declaration of Human Rights (adopted in 1948 by the General Assembly of the United Nations) is printed in it’s entirety, and it’s quite a declaration to read though. Also, the book is manufactured using wind energy, partially recycled, 100% forest-managed paper and over 50% vegetable-based inks, and for every tree used in the manufacturing of the book, two trees are planted in Afghanistan or other war-torn countries by Roots of Peace. This organization ensures that the land is first de-mined and safe. Then fruit and nut trees are planted and the people are taught how to cultivate the crops. This sustainable and socially responsible way of book-making is in keeping with the book’s message of activism. It really is a touching book that any family could benefit from reading and discussing. And that’s where you guys come in – I have 2 copies I want to give away to readers of The Good Human. Count me in! Would love to share this with the kids in my 9th grade class. Thanks. I would love to give this book a read. The organization I work with, Students for Cambodian Schools, is very interested in providing economic opportunities for children in Cambodia, which cuts down on human trafficking there. I am always interested in learning about these sorts of issues around the world! This book sounds fascinating, a great reminder of the less fortunate faraway world for the little reader. Count me and my baby in. Then we’d share it w/ her godmom. Sounds like a great read! ~ 🙂 I would love to share this with my children! Thanks! what a touching book. i would love to share this with my little one. Please enter me. I would share this with my sister who is an elementary school teacher. This book sounds very moving. I’d love to share it with a woman I work with. She is a high school special education teacher who co-sponsors the Amnesty International Club. It sounds like a book she’s really be interested in and could find extremely useful with the Amnesty group. I would enjoy this book with my three-year-old daughter. We have lived in Costa Rica in the past and her father has travelled to remote areas of Peru and Morocco and other places. It is always important for her to understand the realities of other existences. I believe this book would help outline those issues in a way she can relate to. Thank you for this opportunity! Would love to be entered in your drawing for the book. I am a doula (women who help women give birth) and would love to go to countries around the world and help in some way. Please enter my name in the drawing. I would like to read and share with my daughter. After reading it I will give the book to a family friend who is a rising leader in South America that has end hunger projects in Brazil and Mexico. I would love to share this book with children attending our Summer Camp. I work at a non-profit Nature Center and one of our themes this summer is “Science Safari.” The kids will virtually travel to another country each day, and learn about the habitats there (the threats to them, and what can be done to help) as well as some of the cultures. The kids are all from very well to do families, so it would REALLY benefit them to learn about how children in other countries live. Thanks for sharing this book! This really sounds like a good read. Home School 5 kids, this book will get alot of use.